Measure wind velocity in 5 different formats. Anemometer also measures temperature and calculates wind chill. 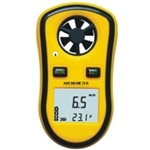 Measure wind speed, temperature and wind chill with high accuracy. Magnetic induction plastic impeller and NTC thermometer assure 0.